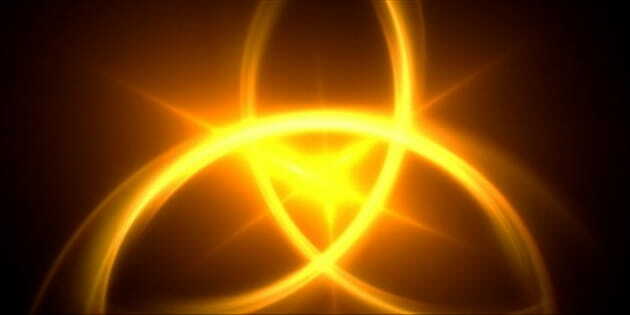 Yesterday was Trinity Sunday, that Sunday when pastors hem and haw and preach on something else. I was crankin' up the start of a sermon series, and so I didn't go there. Not yesterday. But that doesn't mean I'm shy about the Trinity, or that I hem and haw around it. Like the Sunday before, when I'd found myself at a Jewish retreat center, celebrating Shavuot with that community. I and another area pastor had been invited out by their rabbi to talk about Pentecost, and the way we Jesus-followers understand this festival day that our traditions share. My colleague hit most of the theological points I was going to make, so when I got up to talk, it was mostly about the connections I have with the Jewish community personally, having married into the faith and raised two Jewish boys. Afterwards, I stuck around, and engaged with folks, and in the manner of any good Jewish conversation, there wasn't a whole bunch of shyness when it came to getting right to the hard questions. One woman, a sharp-minded Israeli who'd already pitched out some incisive, well-stated hardballs, got right to it: "Explain the Trinity to me," she said. "It has never made any sense to me at all." And so I did, launching into my usual wide-open-throttle explication of the philosophical underpinnings of trinitarian thought. I started with Tertullian, because that's where it begins, and we reformed types have to go ad fons in any explanation. From there, I explored Tertullian's use of the term prosopon, or "persona," to articulate the interrelation in his treatise Adversus Praxean, and how prosopon means a corporate person in Roman legal thought and is also the name for the identity-masks in classical Greek drama. Then, on to the Cappadocian Fathers, and the deeper application of Aristotelian substantial frameworks implicit in Tertullian to the nature of the relationship. Then, to more explication of the idea of substance to articulate ineffable, fundamental identity, and its use to posit union even in the presence of categorical frameworks that allow the creation of distinctions. Yeah, I know, slow down, son. But she asked, it was clear she wanted a serious answer, and she was following. But showing that the Trinity was a thoughtful, culturally-relevant, and spirit-grounded effort to make the three-and-one implicit in the Gospels and Epistles coherent in a Greco-Roman philosophical context is one thing. It is another to express how that form of categorical thinking has purchase in monotheism. And so from there, I rolled straight into Kabbalistic and Talmudic understandings of G-d. Because, sure, Judaism is completely monotheistic. But our mother-tradition has been around the block with the Tetragrammaton enough to know that the Creator of the Universe can be understood in many ways. "Think of it as similar to the divine emanations of your mystic tradition," I suggested. "For we Christians, our encounter with the Divine is in three expressions, which are distinct in manifestation and conceptually different, and yet at the same time completely one." "Or like the shekhinah, the divine feminine," she said, and I could see in her eyes that the connection had been made. The Trinity suddenly made sense. And she told me so, and she thanked me, which was cool. As a Teaching Elder, those moments are a high point of my vocation. Which is not to attack others, not to tear down, but to articulate the good story of our faith in a way that can be heard.